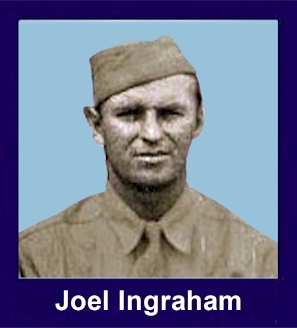 The 35th Infantry Regiment Association salutes our fallen brother, SSG Joel Irwin Ingraham, who died in the service of his country on February 8th, 1945 in Luzon, Battle of Lupao. The cause of death was listed as KIA. At the time of his death Joel was 24 years of age. He was from California. The decorations earned by SSG Joel Irwin Ingraham include: the Combat Infantryman Badge, the Bronze Star, the Purple Heart, the Asiatic-Pacific Service Medal, and the World War II Victory Medal. Joel is buried in Golden Gate National Cemetery, San Francisco, CA. He was said to be tall, blond, blue-eyed, and handsome. He was also brave. (From "Life In The Jungles", Wilbur P Balls history of G Company. Everything was deathly silent the next morning, with not even the chirp of a bird, as we cautiously advanced two blocks into Lupao ready to engage the enemy at any moment. We quickly crossed an unimproved ditch near the corner of the block. At that point everything blew apart! Three camouflaged Japanese tanks, one only 50 feet from us, opened fire at point-blank range with 47 millimeter tank guns and 30 caliber machine guns. Staff Sergeant Ingraham from California was the first soldier to fall mortally wounded about four feet to me left.